Use of granular carbon enables you to save 30-60% of filter aid. According to the United States Nation Bureau of Standards, sugar adsorbed is reduced by using granular carbon to ¼ of that by powdered carbon. From the report of Sucrest Company, We are able to calculate the amount of sugar saved by using granular carbon at the plant with a capacity 100 T/D at 115 kg/D. In other words, there is an increase of 0.1% in yield. It is said in U.S.A. that the life of ion exchange resins can be extended by 50% to 80% by using granular carbon. This equipment continuously decolorizes carbonated liquor as it ascends through the columns filled with activated carbon. Decolorized clear liquor flows out from the collector at the top of the carbon column. Activated carbon which has completely lost it’s decolorizing ability (spent carbon) lies on the bottom of the column and a is removed once a day. 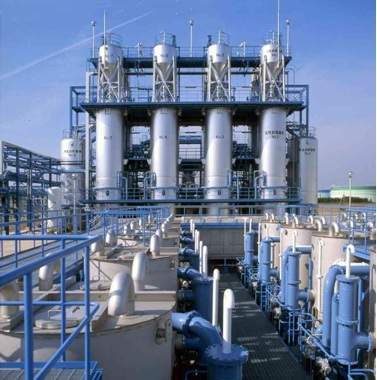 Simultaneously, the same quantity of regenerated carbon is fed to the column from the top (Pulse operation). Spent carbon removed from the bottom of the column is sent to the sweetening off tank for sweetening off, then washed in the washing column. Next it is sent to the No. 1 carbon transfer tank and then to the dewatering screw feeder. After it is dewatered to approximately 50 wt% by the screw feeder, the carbon is fed to the regenerating furnace at a fixed rate. The regenerated activated carbon falls to the quench tank for quenching by water. The quenched carbon is then transferred to the No.2 transfer tank, then to the carbon feed tank and finally, to the carbon columns. Carbonated liquor is led to activated carbon column from the bottom of the tower, and is decolorized as it flows up through the column. Liquor flows out from the collectors at the top of the column. Regenerated carbon is stored in the carbon feed tank. Liquor inside the pores of the activated carbon is recovered by hot water. Pollutants and fine powdered carbon which were not removed in the sweetening off tank are removed by backwash with hot water. Spent carbon from the washing column is transferred to the dewatering screw feeder by the No.1 carbon transfer tank. The regeneration furnace is a 6-hearth multistage furnace. Spent carbon is regenerated by gas at temperatures between 400-960 °C. The oil gear pumps, combustion air blower, center shaft driver unit, center shaft cooling air fan and other machineries are provided as accessories. Seals the water of the chute at the bottom of the regenerating furnace to prevent water intrusion and quenches regenerated carbon at the same time. Regenerated carbon quenched in the quench tank is transferred to the carbon feed tank. Supplies virgin carbon to the quench tank by a carbon ejector. Since 1964, Japan Organo has been manufacturing the so-called Herreshoff type, multiple hearth furnaces. Initially, this furnace found use in Japan for the regeneration of granular activated carbon and bone char used for the refining of sugar liquor. Recently this furnace has found increasing use in the regeneration of granular activated carbon used for advanced treatment of waste water and sewage. This furnace is also used for activated carbon used for the treatment of food ingredient solutions such as monosodium glutamate. – Carbon regeneration loss in a range of under 3 to 5%. – Heat and gas composition are controlled smoothly so that the impurities adsorbed in the micropores of carbon are completely burnt off and removed. – Minimal installation area requirement with greater hearth area. – Robust structure with a long use life. – A continuous screw dehydrator controls the feed carbon to a constant moisture content, thereby stabilizing the furnace temperature. – Variable retention time of carbon in the furnace. – Carbon is fed to, and discharged from the furnace by pressure, thereby minimizing attrition loss of carbon compared to ejectors, pumps etc..
– The exhaust gas combustion system and a wet scrubber prevents air pollution. – A flame detector is provided to sense ultraviolet emitted by the furnace flame. The detector gives an alarm to stop the supply of fuel when the flame goes out. – Easy operation and maintenance. The Herreshoff type furnace has a structure best suited for the control of heat and chemical reaction required for the regeneration of granular activated carbon. The carbon to be regenerated is handled gently with minimum mechanical attrition. The furnace consists of a cylindrical shell of sheet steel lined with fire bricks, and mounted hearths also made of fire bricks. A center shaft extends through the vertical axis of the furnace, and is rotatably driven by an electronic motor and gear drive. Axially extended arms equipped with rabble teeth are attached to the central shaft. Granular activated carbon to be regeneration is fed into the furnace from the top to the uppermost hearth. Then the carbon is slowly transferred towards the center by the rabble teeth and drops to the second hearth. On the second hearth, the carbon will move to the edge and drop to the third hearth. This is repeated until the carbon reaches the bottom hearth of the furnace. Regenerated carbon is then discharged into the quench tank. Plural burners are mounted in the sidewalls of the furnace. Also, penetrating the sidewalls of the furnace are a series of air tubes to supply external air. The regeneration of granular activated carbon is carried out in three steps. 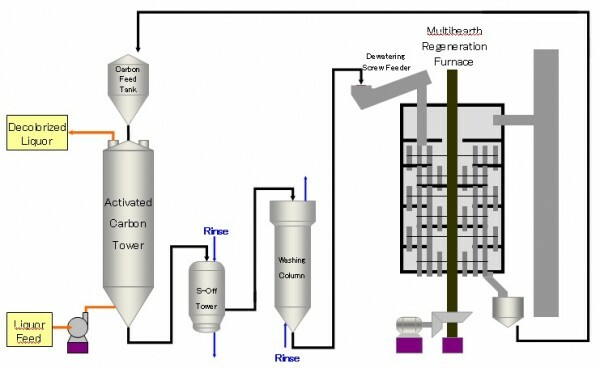 1) Drying, 2) volatilization of impurities and 3) gasification of carbonaceous impurities. Water contained in the carbon is evaporated in the first step. The organic matter adsorbed on the carbon is volatilized or carbonized in the second step. The carbonized impurity residue (hereinafter designated C*) is gasified in the third step. The drying and volatilization steps are effected only by heat. When the temperature of the carbon granule exceeds 100°C, water within the pores will evaporated. When the temperature is over 400°C, the organic matter adsorbed on the carbon is decomposed into hydrocarbons, hydrogen and vapor, which are then liberated from the carbon pores. The carbonized impurity residue C* remain in the pores. This residual C* is then gasified at higher temperatures. Since C* itself is carbon, the regeneration operation must be controlled so that C* alone is gasified with the minimum of burning loss of activated carbon itself.